People all over the country are talking about sea otters, thanks to the press coverage of our annual sea otter status report! We’ve gotten all sorts of expressions of concern and support for the sea otter, for which we are grateful–letting the public know about the otter’s plight is key to gaining support for conservation measures that will help otters recover. It was brought to my attention that some of the wording could have read to allege that The Otter Project conducts sea otter surveys, which is not the case. To clarify, The Otter Project issued a status report this week based on data that is distributed by federal agencies, primarily the US Geological Survey. This includes the spring count from spring 2009, and monthly stranding information from 2009. As an advocacy group, we synthesized the data according to our chosen indicators. 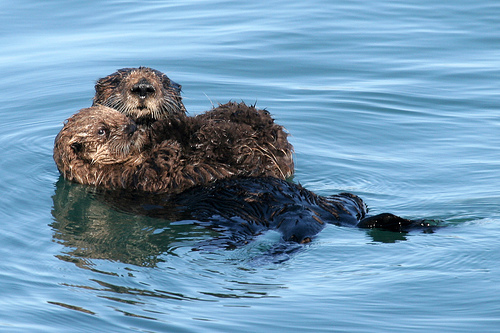 A wide variety of agencies participate in collecting data used to assess sea otter populations. USGS orchestrates the biannual surveys, with participation from the Department of Fish and Game, the Monterey Bay Aquarium researchers, and many others. Similarly, stranding data is compiled and distributed by the Sea Otter Stranding Network, which is also orchestrated by USGS, but involves a wide range of agencies. When talking with reporters, the public, and anyone else, we are careful to make this distinction. Still, I can see how a status report based on surveys and a census might get confusing. At least its alliterative. We are careful to give credit where credit is due–and grateful for the hard work of field researchers that gather this information. The spring survey will be conducted in May. We’re hoping it will yield better news this year, so our 2010 status report (which will come out in 2011) will be cause for celebration instead of concern! If you haven’t seen the press, check out the original article in the Santa Cruz Sentinel: Sea otter population declines for third year, report shows . Otters Struggle to Keep Numbers Afloat from the San Luis Obispo Tribune is also good. Read the full annual status report on our webpage. I am the new Executive Director of The Otter Project in Monterey, California! Originally from the Bay Area, I went to school in San Diego, and came back north to Monterey for graduate school, where I found my calling: saving sea otters! Working for The Otter Project combines my passion for environmental policy with my love of animals. When not advocating for sea otters, I enjoy yoga, volunteer wildlife rehab, reading, and spending time with my cat Alyssa, who, for the record, I did not name. I have been with The Otter Project since November of 2007. This entry was posted in conservation, General Information, Outreach and Awareness, Research, Sea Otter Status and tagged sea otter census, sea otter count, sea otter outreach, Sea otter press, sea otter research and recovery act, Sea Otter Status, sea otters, spring 2009 count, The Otter Project. Bookmark the permalink.